Let me start off with the good. 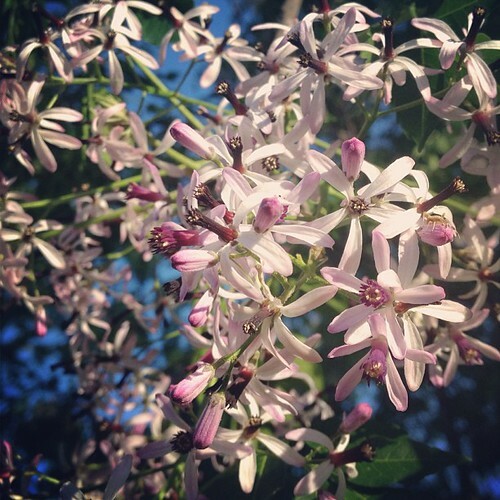 Look at the lovely Chinaberry blooming out back, just above the backyard hives we have set up here at the little Bee Ranch. Lovely. I first noticed they were beginning to bud out during the March bee class and I made a note to check again. Love looking at them. 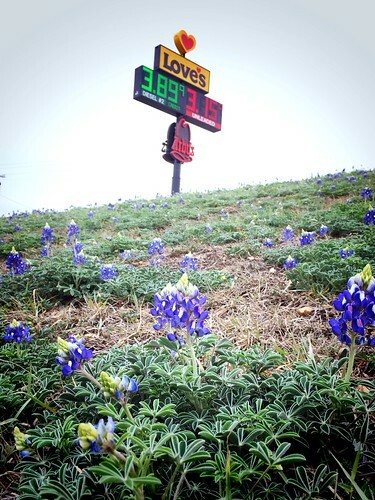 As we drove to market this morning in SA, I noticed that more of these had bloomed all along Highway 281; so pretty! 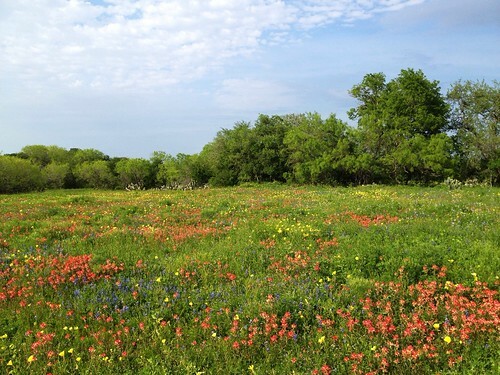 I also enjoyed seeing the spreads of Bluebonnets, Primroses, Indian Blankets, Horsemint (yay! ), and several other flowers I didn’t know names of this morning. I love this time of year. Weather’s still enjoyable and cool-ish. 🙂 No 3-digit oven temps just yet. And now for something a little less good. 😦 I just want to share these things with everyone so that our new beekeepers (who are hopefully reading our blog posts as we suggested or joined up with a local bee club) will also be on the alert. So you know what that is? 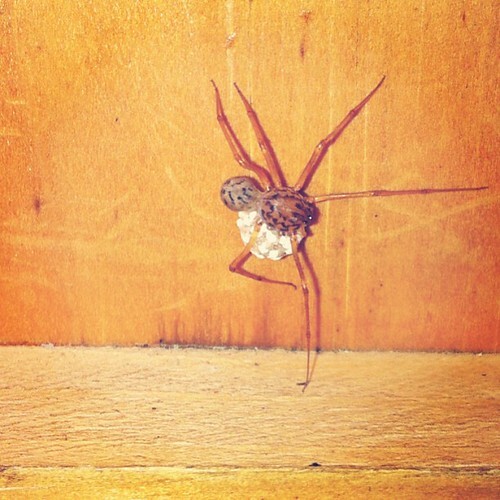 We looked at many pictures to confirm it…brown recluse. Yuck. And what’s that you see under her? Egg sack perhaps!? Double yuck. I sure was not happy when Mark showed me that picture. This little beauty was actually ON our observation hive that we pulled out of the garage for the first time this year. It’s been in there since the weather turned cold and we stopped taking our bees to markets. If he hadn’t gotten the box out for display, that means more than likely that sack of tiny, terrible babies would be all over our garage! 😦 Thank God things happen they way they did. He killed the spider and got rid of the sack as well. Between the rattlesnake den and the brown recluse plus sack and all the crawling, long, fuzzy black caterpillars…it’s amazing Smokey’s not been carried off somewhere. We’re going to have to really watch ourselves (minus caterpillar danger) and you should also. 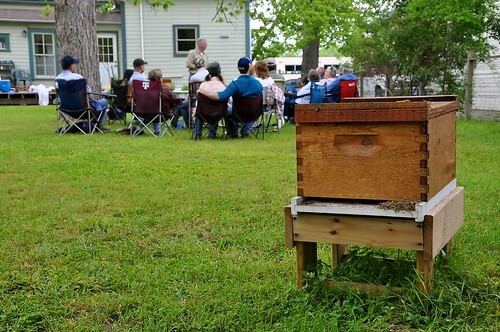 For new beekeepers, please keep in mind that things crawl in and out of our bee boxes all the time so take precautions when you are checking your hives. Which you should be doing now. 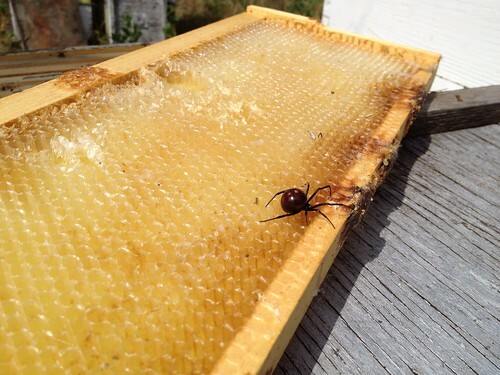 If you don’t recall, last year during harvest, we ran across black widows under the lids on some hives. Danger! Just be careful out there. What does that title mean, you ask? Well…this is a title that has been bestowed upon our little piece of paradise by a student after Cupid tagged her and a fellow student! So sweet! I loved that phrase and asked if I could share it with you all. We love meeting people – we have made so many wonderful new friends the past year as we launched our classes. And now we can say that our students also love meeting each other! 🙂 We wish our lovebirds the very best and we hope to get an update on how things go for them. It’s a busy month for us. We’ve got every Saturday booked – which is a blessing but sometimes it does get us tired. 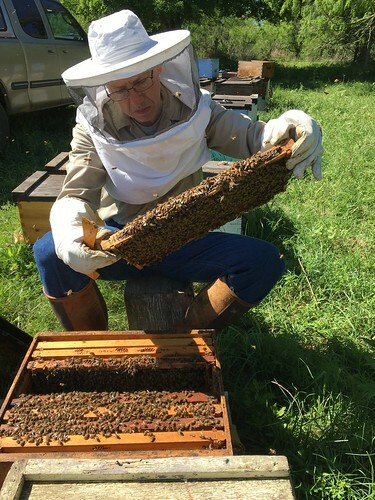 🙂 We had another wonderful class yesterday with fourteen students and since we are in the midst of hive growth and honey production, each class yields something new for students. When the opportunity presents itself, students have gotten to dip into the honey on a frame, lift supers filling up with honey to see how weighty it can be, find and squish a hive beetle (thank goodness those are not a problem this season so that’s only happened once). Lots of fun and I’m never sure what new thing I’ll photograph the students doing. The bees were flying great even though we were all in the way but no one got stung and that’s always a wonderful thing. I think we were in the hive for a good thirty minutes and the bees were as great as you could ask of them. To see the full set of photos from class, check out the Flickr album I just finished loading. 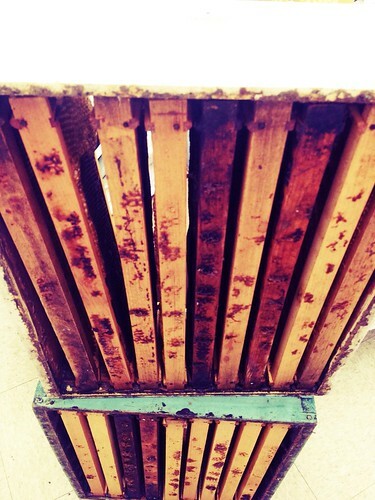 Next weekend we have our advance topic class – How to Build Your Hives Up in the Spring. It’s our second time teaching it and we still have seats so if you’d like more information on it or to sign up, just drop us a line at info@gretchenbeeranch.com or you can call 830-305-7925. We would love to see you! I made a flyer for the class and it’s on Flickr if you’d like to see it. 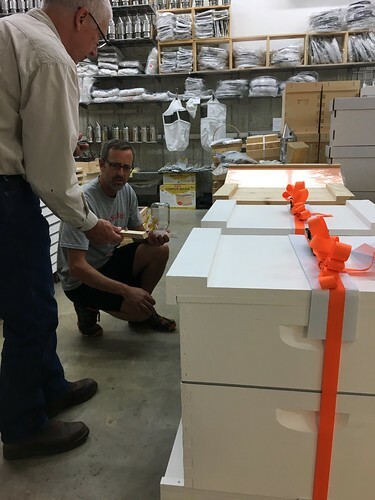 It’s another busy week – my brother and his family are visiting from California so we’re thrilled they’ll be checking out the bees and our operation while they are here. 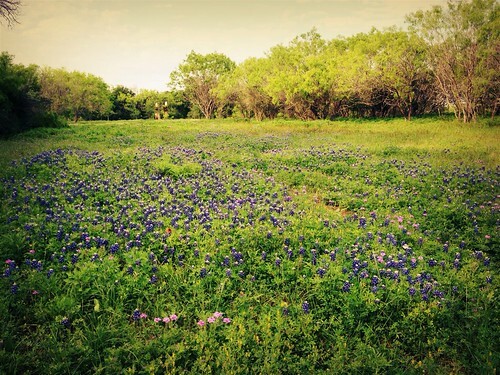 Since Mark has daily checks to do at bee yards, they will have their pick of opportunities to see the beautiful Texas landscape currently still in bloom. We’ve also got another visit out to the Marriott to check bees and to also work on the honey display in the restaurant. We have some good ideas to make it an interesting experience for their customers and we’re excited about the opportunity. Here is a shot of the wonderful Deadman Creek when we went to check on the bees there. 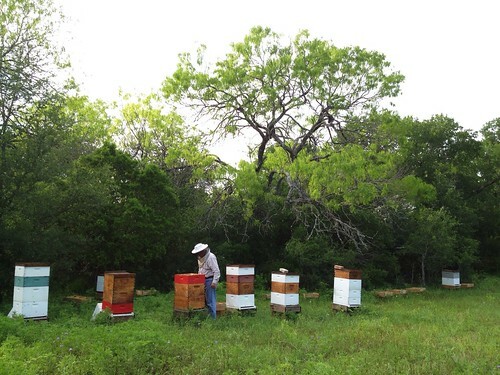 This bee yard is on the Lazy U Ranch, which is a wonderful organic ranch – we are so glad to be there! They are making delicious honey out there and Mark will return there tomorrow to put another super on one of the strongest hives we have there. Hope you all enjoy your week! There’s no better way to end the day in my opinion than to have Mark drive up and say, “I have to go to one more yard to check the bees. You wanna go with me?” YES. 🙂 Especially this year with all the green everywhere and now the splashes of color all over the countryside. It is amazingly gorgeous and never ceases to take my breath away when I see it. I can’t even fully capture the essence of the beauty we are currently enjoying here in the Seguin area. The above shot is what we saw as we drove to the Lazy U Ranch just off Highway 725, about 10 minutes from our house. This ranch is a certified organic ranch (really!) 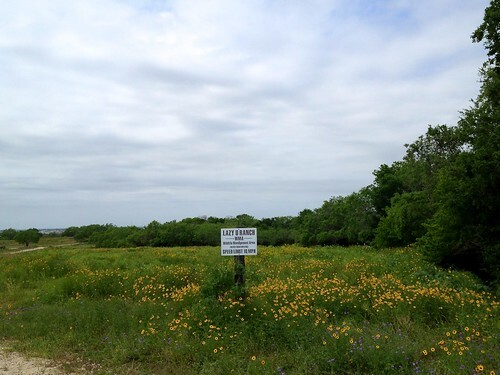 and the owner has been working to bring back the native grasses to his property. I’d say he’s doing a great job. What’s amazing to me is that this area is predominantly yellow and orange flowers while the areas closer to the hives feature blue and purple flowers predominantly…of course there’s lots of mixing of flowers and colors everywhere. 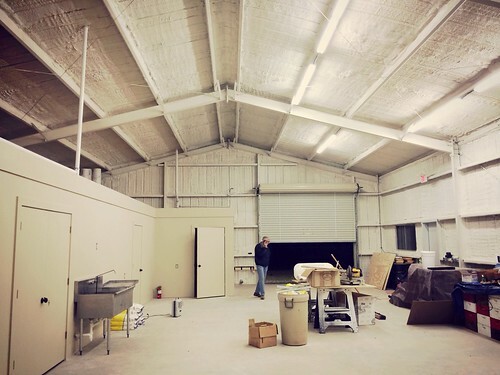 Here’s a look at another area on the ranch. While I wandered around snapping pictures and enjoying my time outside (yes, no allergy restrictions this year thanks to the honey), Mark checked on the hives and added more supers. 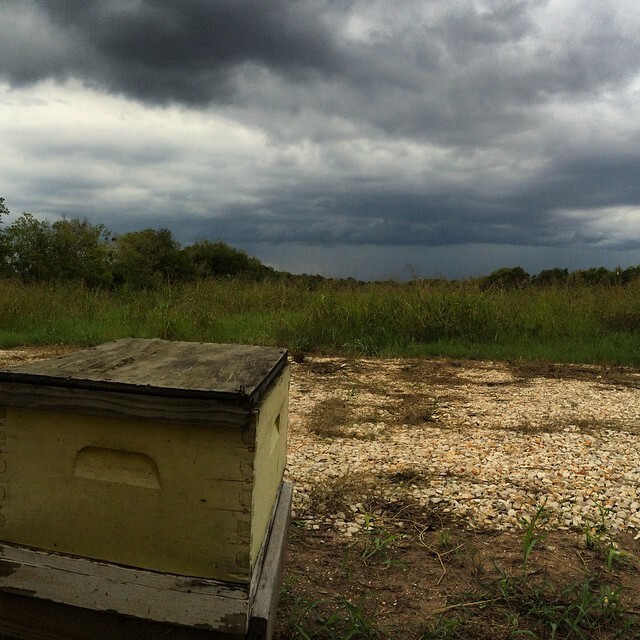 Yes, they are making honey and going to town with it. They were flying well and doing well. Mark says it’s one of his best yards. Looks like he got them through the drought and then winter just fine. I sure like the looks of those growing hives. 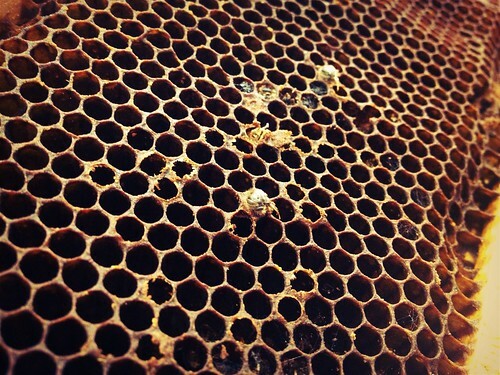 We didn’t get to see much of this growth last year as the honey season was so brief. I can’t wait to see how high these boxes might get and how many harvests there might be. 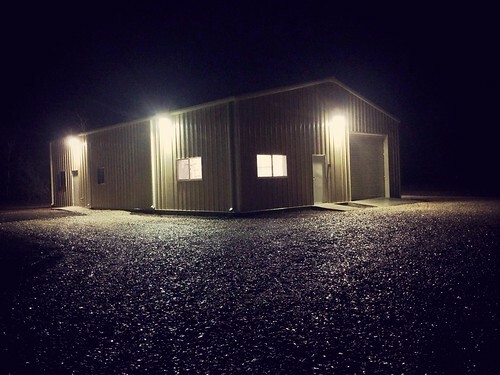 Who knows…might we have another two harvest season like we did in 2010? You never know! 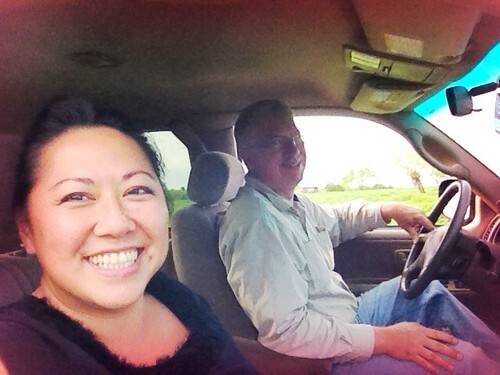 Here we are cruising on out of the bee yard…you can’t help but smile when you have so much beauty around you and perfect weather for enjoying nature. What a blessed life we have. 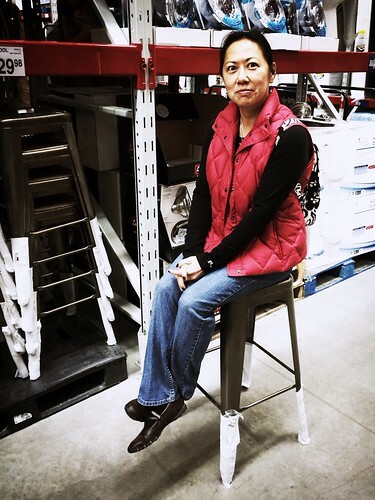 By the way, I have a great guy – he never knows when I’ll holler out, “Smile!” He smiles. I snap. And here we are. 🙂 Thanks sweetie. 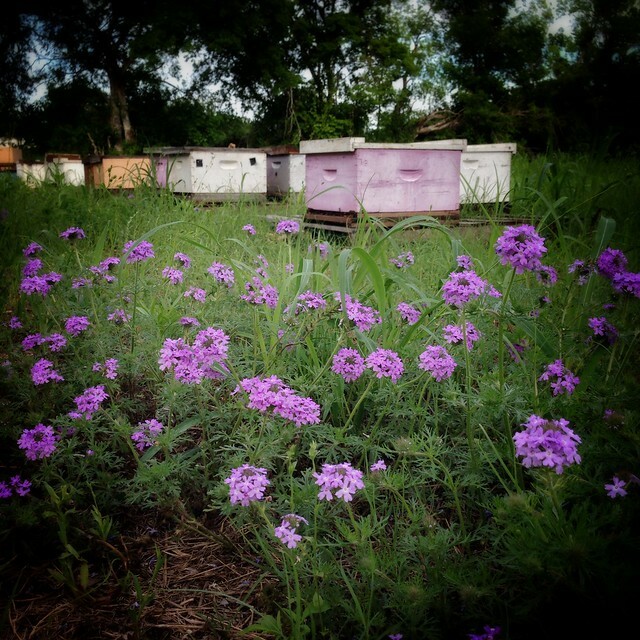 We are so thrilled with the bees’ progress in the yards. There is plenty of nectar and pollen out there right now and it appears they have their pick of what to bring back to the hives. The Huisache is gorgeous – prettier than I’ve ever noticed before but for some funny reason, the bees are not on it as much as we thought they’d be. Perhaps due to the other food sources available right now. They continue to go to the wild mustard and we see them in the wildflowers, especially the Bluebonnets. There are wild raspberries along the tanks at the Farm Yard and they really like that as well. Mark says it looks like a great year for Horsemint – I love that. It’s a lovely flower to look at and to smell. Last year it was quite pitiful – they blooms very sparingly and what we did see was puny and somewhat dull, almost brownish. 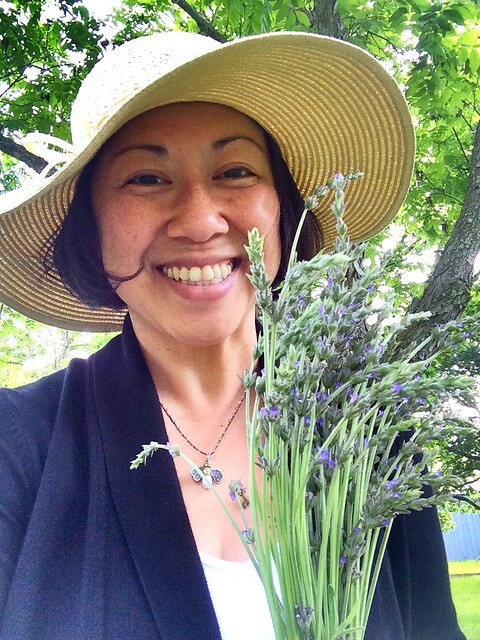 I hope to snap some lovely, lush blooms this year for you to see. 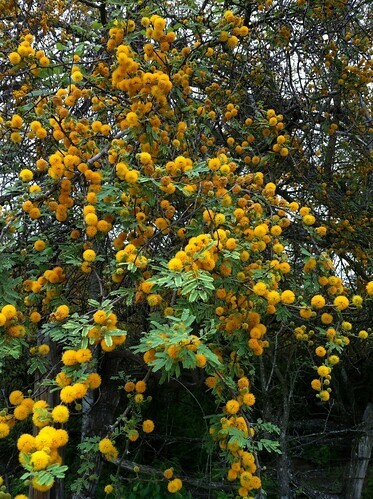 The above shot of the beautiful pompoms on the Huishache is one that I love looking at. Mark shot it while at the Big Oaks bee yard. Before saying goodnight, I wanted to share two pictures I snapped last night while making gift baskets out in the honey house. Mark pulled these two honey supers out of the freezer we have out there. To help with any issues of wax moth or hive beetle larvae, you can freeze the frames and super and it takes care of the problem. These have been in there for months and they are ready to be used this year.